polyurethane screen panels have a uniform and stable surface of the air holes, the screen has a screening and filtering effect, the specifications of the screen is often expressed in units of length of the number of holes (mesh), also useful to the width of each hole to represent, you know what its characteristics? 1, good wear resistance, long service life, the wear resistance of steel mesh 3 to 5 times, more than 5 times the ordinary rubber sieve. 2, small maintenance workload, polyurethane screen panels are not easy to damage, long service life, so it can greatly reduce the amount of maintenance and shutdown maintenance losses. 3, the total cost is low, although the same size (area) of polyurethane screen panels than stainless steel plate one-time investment is high (about 2 times), but because of polyurethane screen panels stainless steel plate life is 3 to 5 times, and repair and replacement times net less, so the total cost is not high, the economy is also very cost-effective. 4, good moisture resistance, can work under the condition of water as a medium, and in the case of water, oil and other media, the friction coefficient of the polyurethane material is reduced, more conducive through the sieve, improve screening efficiency, and avoid wet adhesion of particles, while the coefficient of friction due to reduced wear and reduce, improve service life. 5, corrosion resistance, non-flammable, non-toxic and tasteless. 6, due to the reasonable design of the sieve, sieve plate manufacturing process is unique, the limit size of the particles will not clog the sieve. 7, good vibration absorption performance, strong silencing ability, can reduce the noise, and make the screen in the process of vibration is not easy to break. 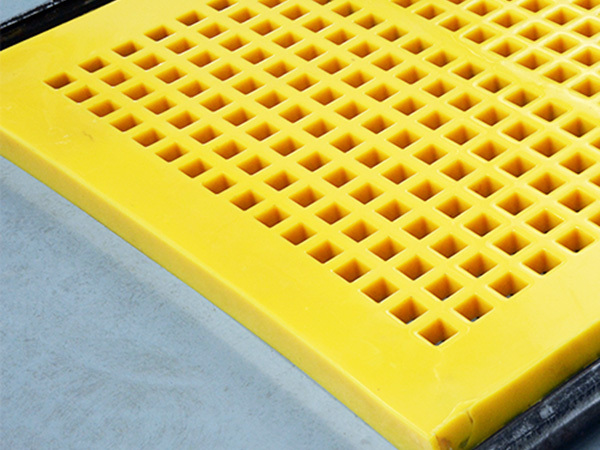 8, due to the characteristics of polyurethane secondary vibration, polyurethane screen panels with self-cleaning effect, and therefore high screening efficiency. 9, energy saving, the proportion of polyurethane is small, much lighter than the same size steel screen weight, thus reducing the screening machine load, save power consumption, and extend the life of the screening machine.